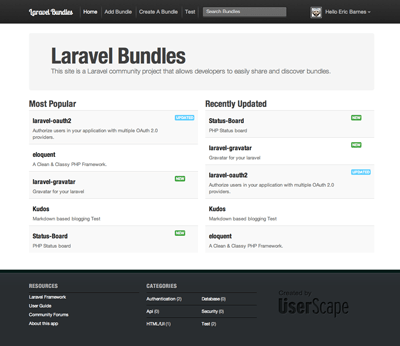 Since starting at UserScape I have been tasked with building a new bundle application for the Laravel framework. So far all the work has been done “behind the scenes” but I wanted to share a few screenshots of what I have completed so far. This is a temporary home page which showcases the latest and the most popular. Currently the most popular will be determined by number of installs but I have some ideas for better stats and filtering that will come later. This is the grid list. I tried keeping it simple so you can quickly scan the titles and also show each users gravatar for branding. 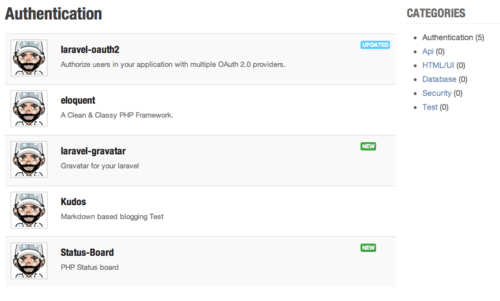 I am really happy with what I have completed so far and it should be a simple and effective way for users of the framework to find pre-built code to put in their applications.